What’s up Everybody! We’re kicking off the month of July with an oldie but but goodie, a special REWIND episode of Dem Black Mamas. We’ll be dropping new content on the 1st and the 15th of each month. 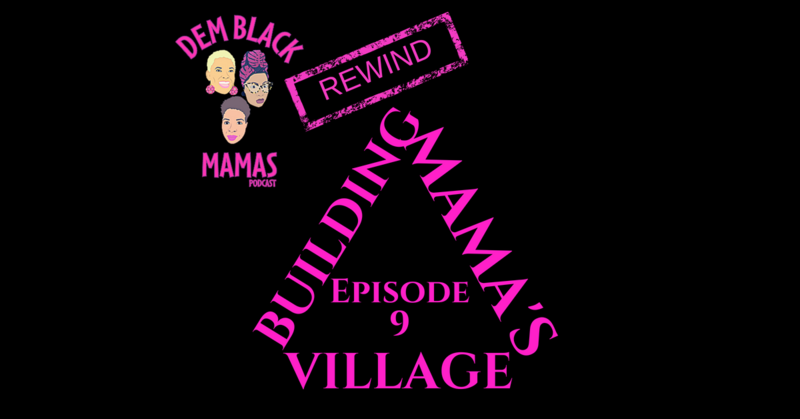 Until then check our most listened to episode Building Mama’s Village. In this episode we discuss the importance of our different journeys in building villages, virtually and physically that have nurtured us on every level of our being: as mothers, Black women, creatives and entrepreneurs. We open up about how our fears and anxieties of letting people in and our childhoods inform the way we build villages. We begin the conversation with a very interesting discussion about the impact integration had on Black folks ability to build community. Be sure to subscribe wherever you listen. If you’re listening on iTunes, please rate us and if you have a little more time please leave a review. If your listening on SoundCloud, your comments are welcomed. Follow us on all social media platforms @demblackmamas. If you’re feelin’ this episode we ask that you share, retweet and/or repost but if you’re not big on sharing on social media, just share with one person who you feel can benefit from listening . As always you can DM or email us at demblackmamas@gmail.com with your thoughts, questions or to just show us some love. We love hearing from you!